It was best stated back in the 1988 September issue, of one of the industry's leading magazines... and I quote word for word from the article: The article reads: The EPA is on record stating catalytics represent the "best demonstrated technology" the industry has today. In other words, it's the federal agency's policy that combustors are the best solution to the wood smoke problem. I would like to add this comment:I have talked to consumers over the years, that had catalytic units that held up for 10 to 15 years and were still working on the day they called me.Easy to see why FIRECAT combustors are offered to consumers with a 6 year prorated warranty from the date they buy a new catalytic stove. A few more related comments:1. 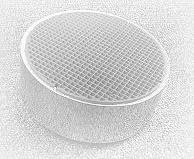 FIRECAT catalytic combustors are made of high temperature, honeycomb ceramic and will take up to 2400 degrees F. before they reach, what I call a glazing point. Naturally, the stove will never reach this kind of operating temperature to destroy the combustor. They are durable and hold up well under proper operating methods. Flame impingement and thermal shock, not normal operating methods, can be another story altogether. This will be addressed at a later date. 3. FIRECAT combustors can save the stove owner a lot of money over the years. Consider fuel costs alone. (as much as 1 less cord out of every 3) By burning low, they will save on fuel costs and best of all with no sacrifice of BTU output. The FIRECATThe FIRECAT combustor will produce temperatures that are at least twice that of the firebox. Therefore, they don't need high flames in the firebox to produce heat to keep warm. Check out the catalytic stove's efficiency and do some comparing.